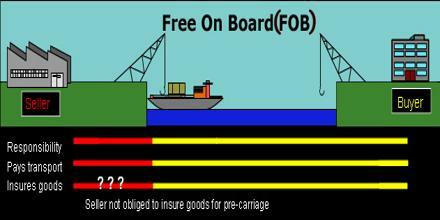 Free On Board is a term in international commercial law, which was also called collect freight, freight collect, or freight forward. It is a trade term that indicates whether the seller or the buyer has liability for goods that are damaged or destroyed during shipment between the two parties. It was basically used in shipping to indicate that there is no charge to the buyer for goods placed on board a carrier at the point of shipment. This terms do not define transfer of ownership of the goods.